Where Roots And Wings Entwine: Halloween fancy dress costumes. Lee is like a big kid at the moment, getting all excited about dressing up for Halloween. As well as wanting to dress up for our spooky Halloween party he is also dressing up for work as they are doing a week-long celebration for Halloween and all of the staff are dressing up in Halloween inspired fancy dress to wear whilst they serve the guests who come to enjoy the celebrations and activities being hosted at the holiday park’s pub. Whilst browsing the internet for the perfect fancy dress costume to wear to celebrate Halloween this year Lee has found a number of costumes he loves and wants to buy to dress up this Halloween (and being the big kid he is I suspect to wear throughout the year too whenever the mood hits) on mrcostumes.com. 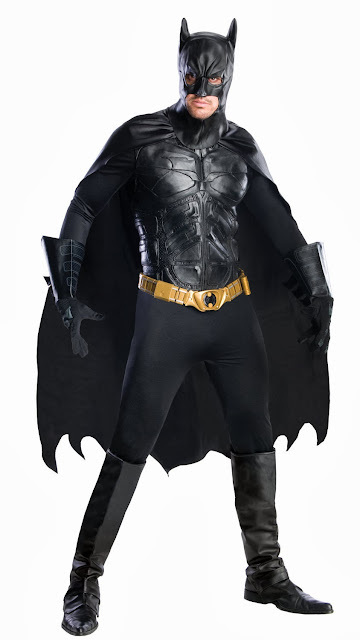 As Lee is a fan of Batman he would love to dress up as the man himself and pretend to be Batman. Being a fan of the Batman series he would also love to dress up as the character Joker. As I love Johnny Depp especially in the Pirates of the Caribbean films I would love Lee to dress up as a swashbuckling pirate. I am also tempted to get Lee to dress up in a Buzz Lightyear costume as I know Bug would love seeing his daddy dress up as one of his favourite characters, Buzz, from Toy Story.